A facile fabrication method to produce biocompatible semiconductor Quantum Dots encapsulated in high quality and thick thermal oxide is presented. The process employs sonication of porous Si/SiO2 structures to produce flakes with dimension in the 50–200 nm range. These flakes show a coral-like SiO2 skeleton with Si nanocrystals embedded in and are suitable for functionalization with other diagnostic or therapeutic agents. Silicon is a biocompatible material, efficiently cleared from the human body. The Photoluminescence emission falls in the transparency window for living tissues and is found to be bright and stable for hours in the aggressive biological environment. The production of functional nanomaterials for therapeutic and diagnostic purposes is one of the major challenges of nowadays nanotechnology [1, 2]. The intrinsic properties of such nanostructures, say, the efficient photoluminescence [3, 4], the strong superparamagnetism , or the characteristic Raman signatures , combined with the large specific capacity for drug loading  allow to forecast wide application in the biological and medical fields. However, the size and charge of most nanoparticles preclude their efficient clearance from the body as intact nanoparticles. Without such clearance or their biodegradation into biologically benign components, toxicity is potentially amplified . On the other hand, rapid renal excretion , observed with particle diameters <5.5 nm, is often undesirable because the relatively short residence time do not allow the nanoparticles to carry out their action. This discussion points out on the importance of the nanoparticles engineering in terms of size and composition but also addresses on the rates of self-destruction and the formation of non-toxic, renally cleared products. Among the various kinds of functional nanomaterials, semiconductor Quantum Dots (QD) received particular attention [3, 4, 9]. These are nanoparticles in which charge carriers are three-dimensionally confined. The quantum confinement provides size-tunable absorption bands and emission color to QDs. The photoluminescence (PL) of QDs is exceptionally bright and stable, with very narrow emission but broad absorption spectra, making them potential candidates for biomedical imaging and therapeutic interventions, but concerns persist about their safety . Most toxicology data are derived from in vitro studies and may not reflect in vivo responses, so the fear of toxicity greatly prevented their employment in studies in vivo. Encapsulation in SiO2 shells [4, 11, 12] is a promising approach for biophotonic applications where hydrophilicity, biocompatibility, and low rates of self-destruction are needed. In the present scenario, an interesting possibility is offered by Si QDs. Silicon is well known as a biocompatible material , widely used in nanomedicine  or in bone growth . In Si nanocrystals with diameter down to 1–3 nm, the exciton quantum confinement is the mechanism at the base of the bright, visible photoluminescence . This effect is easily observed in Porous Silicon (PS), obtained either by electrochemical etching of high-resistivity p-type substrates  or by stain etching . The energy position and FWHM of the PL spectrum is related to the average size and dispersion of the nanoparticles composing the PS nanosponge . Moreover, the electrical behavior of PS can be tuned from insulating to semiconducting (p-, or n-type), independently on the doping type and level of the starting substrate . A recent paper  reports on the use of Si nanoparticles, derived from luminescent PS, as biodegradable optical markers and drug delivery agents. The investigated Si nanoparticles have diameters of 100–200 nm and are agglomerates of single luminescent nanocrystals. PL is centered in the near-IR and quite stable, thanks to oxidation during activation of PL in aqueous solution. Such a structure is particularly interesting for two reasons. First, it avoids renal filtration, prolonging the residence time in the living body; second, its porous structure, reminiscent of the pristine PS, allows for incorporation of drugs and for their slow release. In the present paper, an alternative method to achieve efficient SiO2 encapsulation, with more durable PL and lower degradation in biological solution, is presented. The starting PS samples are obtained by anodizing p+ substrates (1 mΩ cm, <100> oriented). Such material is well known to be composed by nanocrystals with average dimension >10 nm, somewhat smaller in high-porosity samples. As a consequence for the weak excitonic confinement, the resulting PS is poorly photoluminescent. 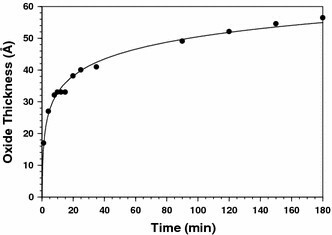 It has been demonstrated, however, that oxidation in dry O2 at 1000°C greatly enhances the PL, with intensity comparable to conventional PS from p-type substrates . This is related to the controlled growth of the SiO2 shell which reduces the Si core to a few nm and to the superior passivating properties of the thermal oxide. In fact, thermal oxide is well known  to be nearly stoichiometric, and the spin density at the Si/SiO2 interface has been evaluated to be small . The PS samples have been oxidized in an horizontal quartz tube at O2 atmospheric pressure. A first, pre-oxidation step at 300°C has been carried out in order to reduce surface Si atoms mobility, preventing in this way the structure collapse at the oxidation temperature (1000°C). Figure 1 reports the thickness of the SiO2 shell, as extracted by analyzing gravimetric data taken from a PS sample with 60% porosity . A AND microbalance with 10−5 g sensitivity has been used for the purpose. The saturation at about 5 nm is related to the full conversion of Si crystallites (10 nm average diameter) into SiO2. In Fig. 2, the gravimetric data are displayed showing the O/Si ratio as a function of porosity for two oxidation times. A saturated value of O/Si = 2 is reached upon the total conversion of the Si skeleton into SiO2. The comparison of the two graphs allows to predict both the Si core diameter and the thickness of the SiO2 shell by a proper choice of the sample porosity and oxidation time. 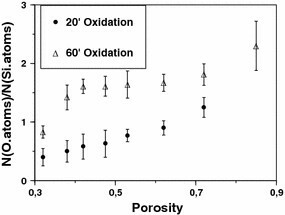 For the present work, porosity varied between 40 and 60%, whereas oxidation duration was in the 10–40 min range. Because of the low samples porosity and the high degree of oxidation, the volume expansion due to Si conversion into SiO2 cannot be neglected. In fact, the pore coalescence has been reported : this effect, especially for the lower porosities prevents O2 molecules diffusion and fixation into the pores. Of course, this is detrimental to the QD passivation. To circumvent this problem, we produced PS multilayers by alternating 40-nm LP (low porosity) and 40-nm HP (high porosity) layers, by means of periodic variations of the anodizing current in the aqueous HF/ethanol electrolyte. As an example, 100 periods comprising steps of 10/220 mA cm−2 were applied by means of a Keithley 2400 programmable current source. Samples have been cleaved before oxidation. The HP layers act as channels for lateral O2 diffusion into the porous structure, allowing for the uniform oxidation of the LP layers. The samples were then sonicated for 6–8 h in toluene, obtaining a suspension composed by two classes of nanoparticles. The first class of <10 nm SiO2 particles derives from the HP layers, whereas the second class is composed by Si/SiO2 nanoflakes originating from LP regions. The dimension of such nanoflakes ranges from 50 to 300 nm and can be separated by the SiO2 nanoparticles by means of a 20-nm membrane filter. A second filtration step, using a 200-nm membrane, allows for further size selection of the Si/SiO2 nanoflakes. The typical structure of a large (>300 nm) Si/SiO2 nanoflake is shown in Fig. 3. 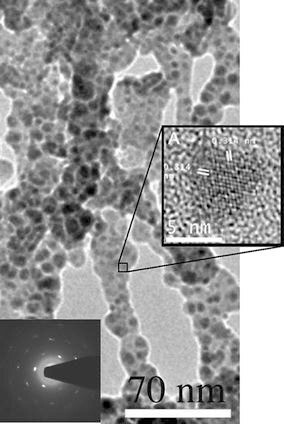 The TEM micrograph shows darker, nearly spherical dots, i.e., the Si nanocrystals, embedded in the SiO2 matrix. Both the thickness of this encapsulating film and the Si QDs diameter are consistent with the previous evaluations. The bright spots and the halo in the diffraction pattern reported in the inset indicates the presence of both amorphous (SiO2) and crystalline (Si) phases. The magnified view confirms the crystallinity of the Si nanodots. Interesting features of the nanoflakes obtained in this way are the coral-like structure and the large specific surface. Both can be fruitfully employed to add further functionalities, e.g., embedded magnetic nanodots, drugs, and other fluorophores. By means of a Sciencetech monochromator with f/4.5 aperture, equipped with an EG&G cooled multichannel detector, the PL emitted by Si/SiO2 nanoflakes under Hg illumination has been analyzed. Light emission is centered in the near-IR, as shown in Fig. 4, and exceptionally stable in ambient conditions, being unaltered after 2 weeks of air exposure. The PL stability is obviously crucial when QDs are incubated into biological systems. This test has been carried out by immersing the nanoflakes into a PBS (phosphate-buffered saline) solution at T = 37°C and pH = 7.5. The PL color remains dark red and the intensity reduces to 60% in about 4 h of incubation, a very different behavior respect to , where the optical emission is reported to start decreasing just after incubation. After 4 h of incubation, the QDs emission blue-shifts and decreases more abruptly, consistently to what reported in . This different behavior is easily explained in terms of thickness and quality of the SiO2 encapsulation. 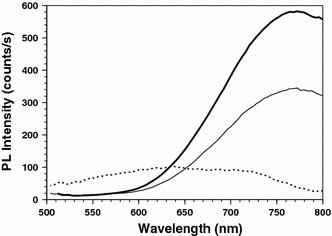 In the present case, the very thick silica layer is hardly consumed by the PBS solution, whereas the following PL quenching and blue-shifting are signatures for the consumption of the Si fluorophores. There are several reports about the biocompatibility of Si nanostructures, most of them related to the PS itself which is a particularly interesting material in the present case, since our nanoflakes directly derive from it. First biocompatibility tests were carried out a decade ago , and more recently, implants of PS into living tissues have been carried out, without the observation of any inflammatory reactions . It is well known, on the other hand, that Si is a common trace element in humans, and a biodegradation product of porous silicon, orthosilicic acid (Si(OH)4), is the form predominantly absorbed by humans and is naturally found in numerous tissues . Silicic acid release from the dots was measured by placing the nanoflakes into a specified volume of PBS and fitting a screw-cap to ensure the volume was sealed. Samples of the incubating solution were taken at 1-day intervals, measuring 400 μl. Data have been compared with those taken from a c-Si sample and an untreated PS membrane. Analysis was by a molybdenum (molybdate) blue assay, in which ammonium molybdate in solution reacts with silicic acid in the sample to form silicomolybdic acid (yellow) which is subsequently reduced to form a molybdate blue complex with a peak absorbance at 810 nm. Silicic acid concentration standards were prepared with sodium metasilicate pentahydrate analysis. The data reported in Fig. 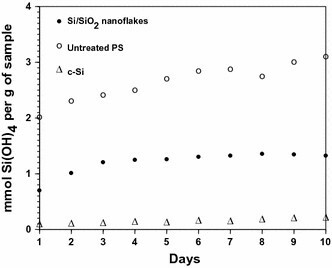 5 show the relatively slow release of Si(OH)4 from oxidized nanoflakes, compared with unoxidized PS. Saturation occurring after 3 days for nanoflakes is related to the full consumption of sample’s mass, which is considerably lower than in the other two cases. It seems that, at the present level if investigation, a possible toxic effect of Si nanodots could be related with O2 radicals, as proposed by Fujioka et al. . It has to be stressed, however, that those authors observed such cytotoxic effect only at high concentration. The method here described allows for producing very stable and efficient Si-based fluorophores, with improved resistance to biological agents, and emitting in the near-IR window for light transmission of living tissues. Si/SiO2 nanoflakes selected in the 50–200 nm range do not undergo the renal filtration, whereas silica encapsulation allows long residence times in the living body, a necessary condition for the nanoparticles to carry out their action. The coral-like structure of the nanoflakes allows for the incorporation of other diagnostic and therapeutic agents. Work supported by the Piedmont Region through the CIPE 2004-D29 Project.